Georgia cracks our top 5 list for worst states for poker players. You won't find any legal real money alternative within the state; Georgia has no casinos, home game don't appear to be legal and when combined with the internet sweepstakes cafe crackdowns, we would guess that online poker isn't on the docket to be regulated. That’s Georgia poker law in a nutshell. But you can read on to get nitty-gritty. I think their definition of gambling machines, when combined with their other laws, also deem online poker illegal. The punishment for communicating gambling information is up to 5 years in prison, a fine up to $5,000, or both. I think online poker is off limits in Georgia. Don’t you? Running or participating in a home game in Georgia could land you in trouble, too. In addition to the (general) passage regarding the offense of gambling (mentioned above), it's important to consider Georgia's law regarding "gambling places." You can get in trouble for both running a poker game and participating in one. You can’t win. And is why we feel Georgia is one of the harshest states for poker players. Even in other states that have no poker rooms, casinos or betting, you can still play poker in a social setting as long as no one makes money from the rake or house fees. Do Casinos in Georgia Offer Poker? You're not going to find any kind of casino or land-based gambling establishment in Georgia. The only option you have is to go to another state, or try a casino cruise liner like the Emerald Princess. These ships offer casino games as well as poker. We get a lot of questions regarding the legality of poker and other types of gambling in Georgia. We thought it'd be helpful to post those here. Will online poker be regulated in Georgia? No, not when you consider how strict they are about gambling right now. Furthermore, like Florida, Georgia has targeted and cracked down on internet (sweepstakes / gambling) cafes. So I wouldn’t expect them to be passing laws for intrastate poker any time soon. In fact, I wouldn’t be shocked if Georgia made it illegal. Is there an online poker room that accepts players from Georgia? Surprisingly, it's still possible for Georgia players to find and play at poker sites online. Unlike the other strict states that prohibit players from even signing up (for fake or real money games), you'll be able to play anywhere that accepts US customers. A few of these sites include Bovada, BetOnline and Sportsbetting Poker. What other forms of regulated gambling is offered in Georgia? The only form of gambling in Georgia is their state lottery. Everything else is prohibited. Where can I read more about Georgia poker laws? Here are some interesting facts about Georgia gambling. 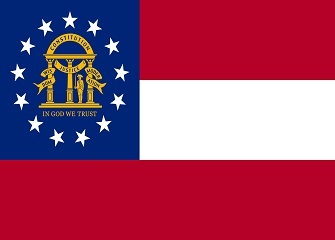 Georgia residents are able to regain gambling losses through the legal system. You have up to 6 months to do so. Following the 6 months ANYONE can attempt to regain the original gambling losses. If won, the proceeds will be split between the winner and the Georgia school system. Steve Loube is the only resident from Georgia to win a bracelet. He won it during the 2012 WSOP.